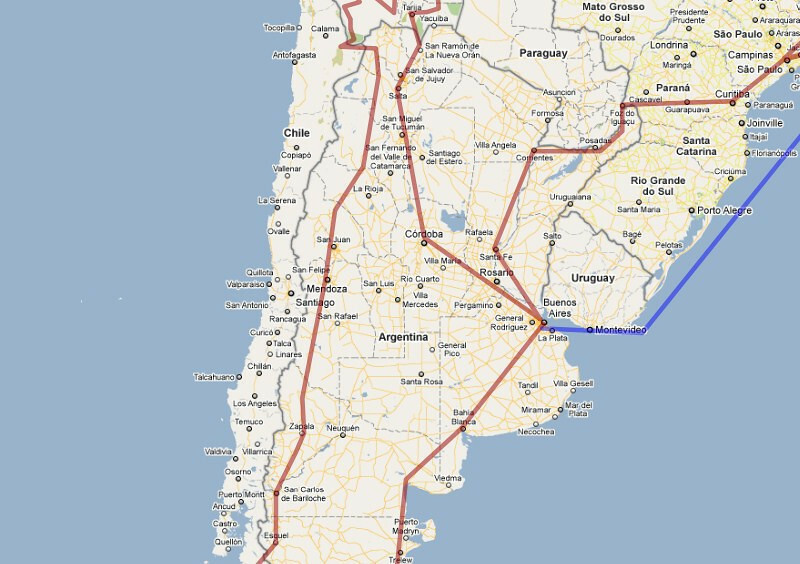 Having looped around southern Bolivia, I was now pointed south, heading to Patagonia and Ushuaia, before turning north for Buenos Aires. 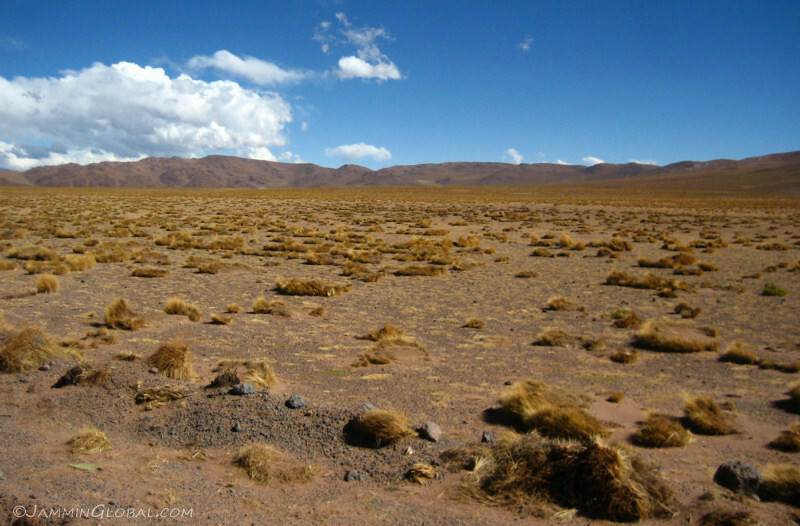 Argentina is the eight largest country in the world, similar in size to India but with only 40 million people making this one of the least densely populated lands in the world. With a third of the people in the capital and most of the rest in the central industrial belt, there is a lot of open land. 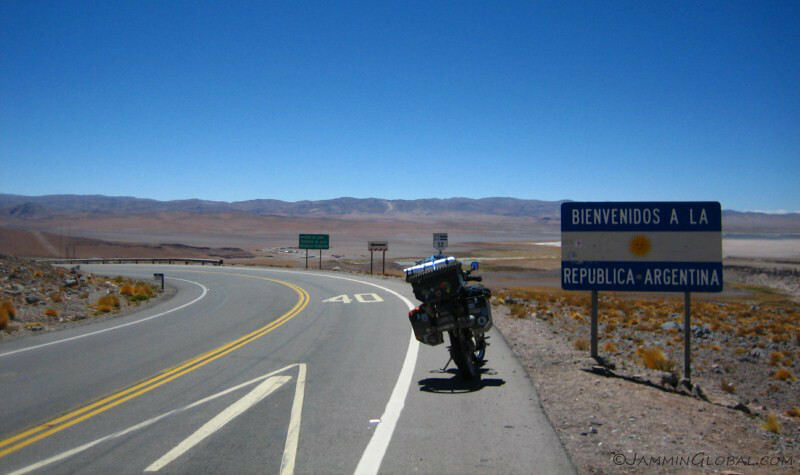 The terrain is quite rough, because either it’s mountainous in the west or wind-swept by the chilling winds from Patagonia, making this excellent motorcycling country. 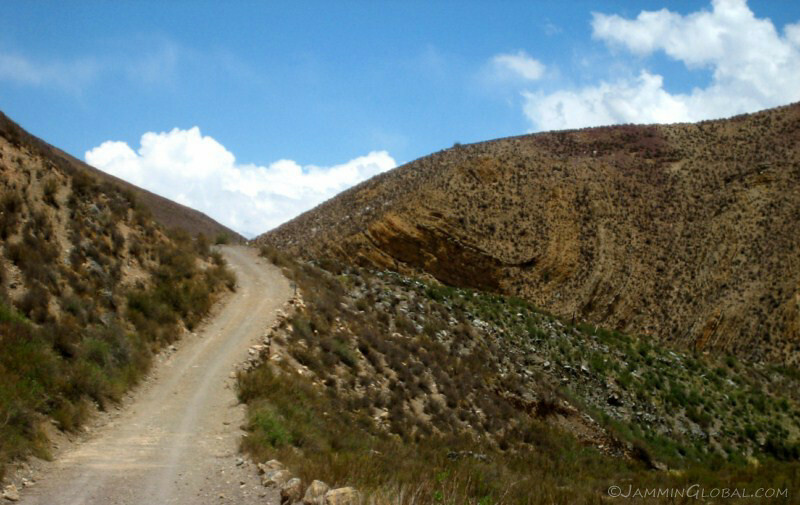 I primarily took famed Ruta 40 most of the way down. 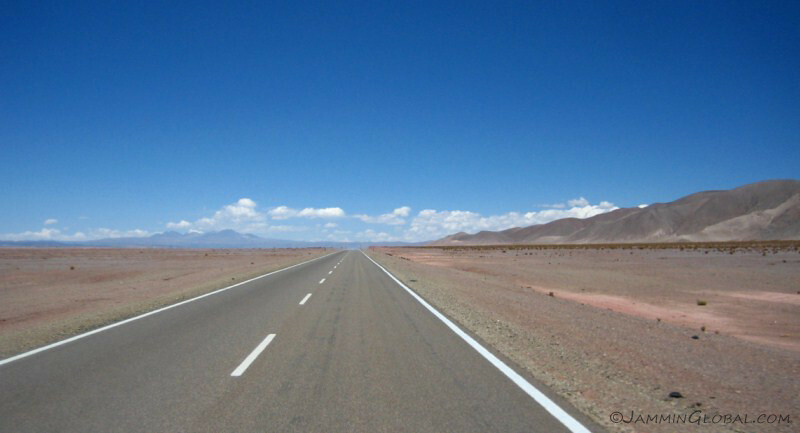 It’s a continuous route heading down the entire spine of the country. 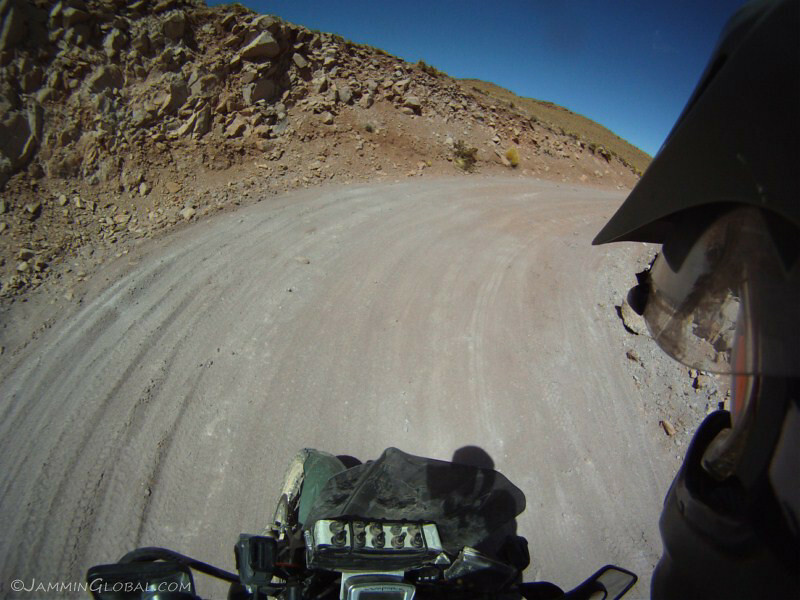 In years past, its gravely surface had a gnarly reputation in the motorcycling community, but it’s slowly being tamed with asphalt. 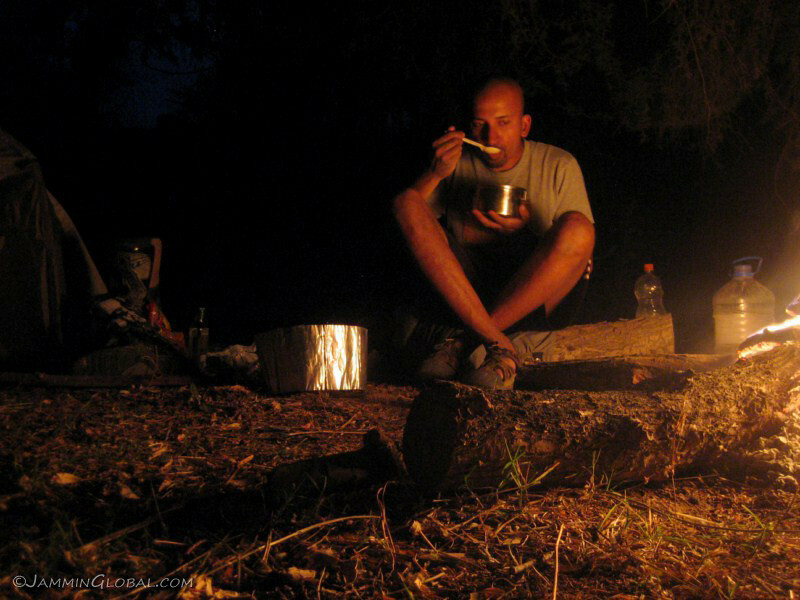 There’s still some adventure to be had in this safe country, where wild camping is easy to do. 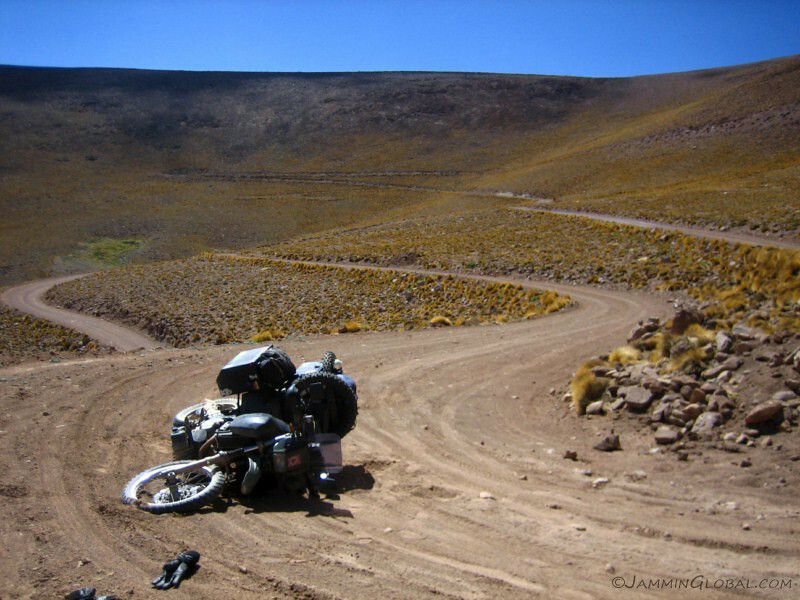 Crossing at Paso de Jama from Chile at 4,200 m (13,780 ft). Blue skies, white clouds and a smiling sun. That sure is an appropriate flag. 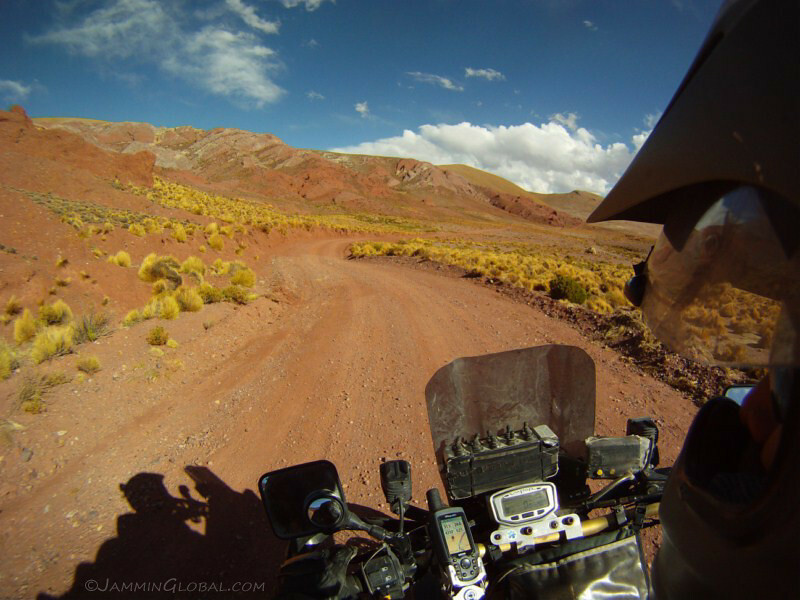 My route down Ruta 40 along the western edge of Argentina. Click on it to go to the interactive version in Google Maps. 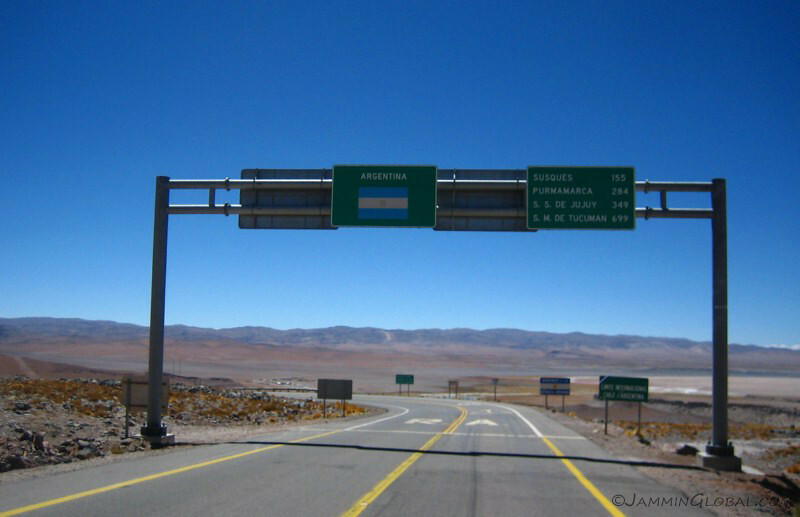 …to turn south on Ruta 40. 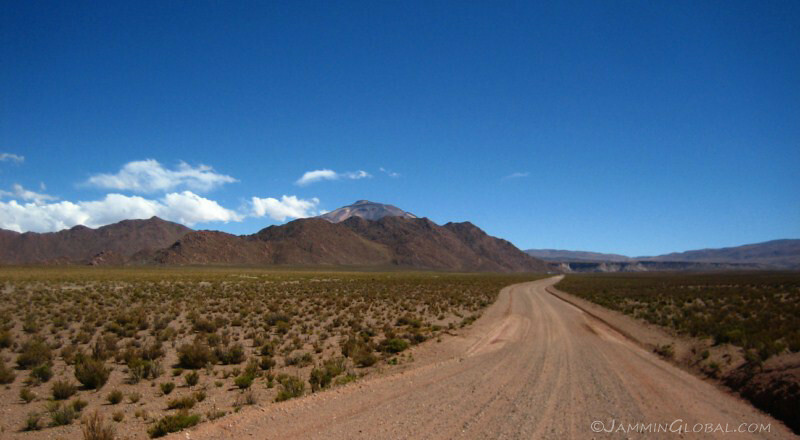 This famous road was gravel all the way to Tierra del Fuego at one point, but slowly over the years, it’s being paved over. But there’s still large sections of good dirt riding left on the old 40. 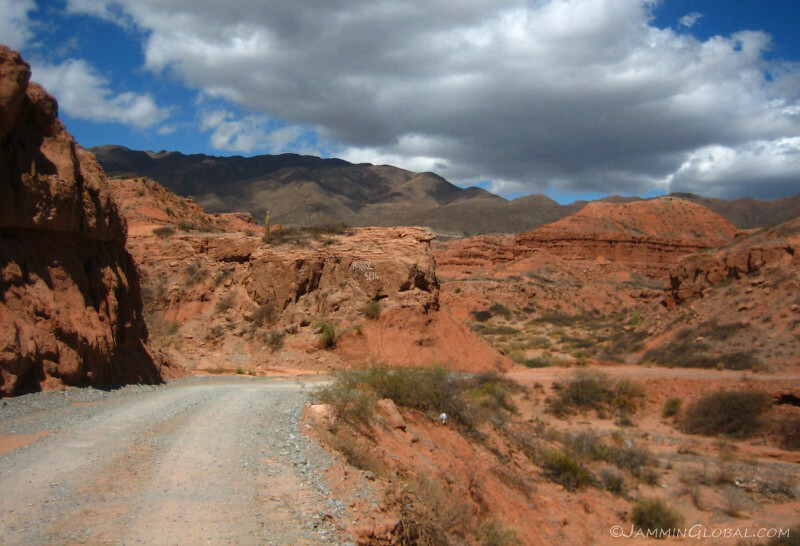 Northwest Argentina is famous for its colored rocks and striking geology. 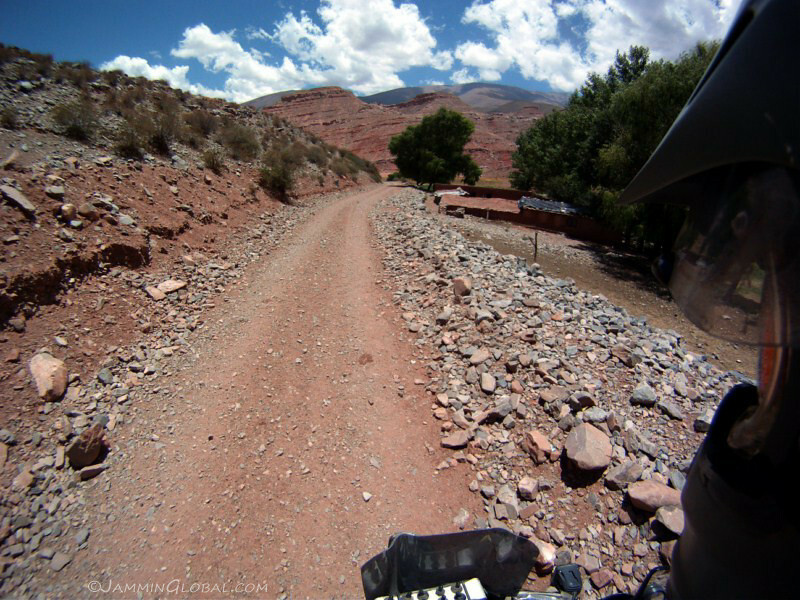 A wide angle view as the route dipped down across an arroyo. 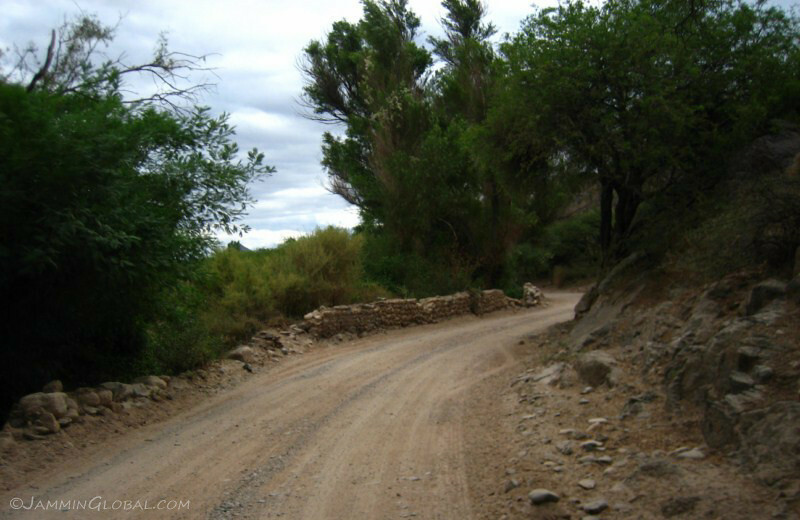 The road was covered in loose gravel, but was well-maintained and corrugations were mostly absent. A mesa-like structure with wind erosion creating its flanks. 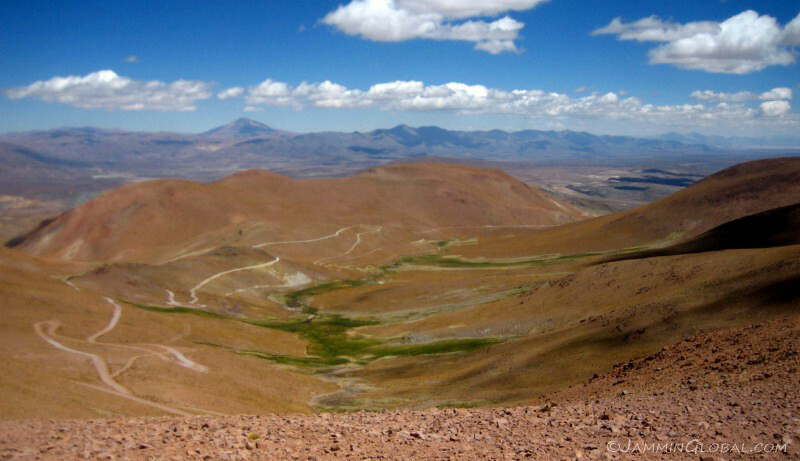 The route climbed high, back into altiplano territory as the vegetation suggested. 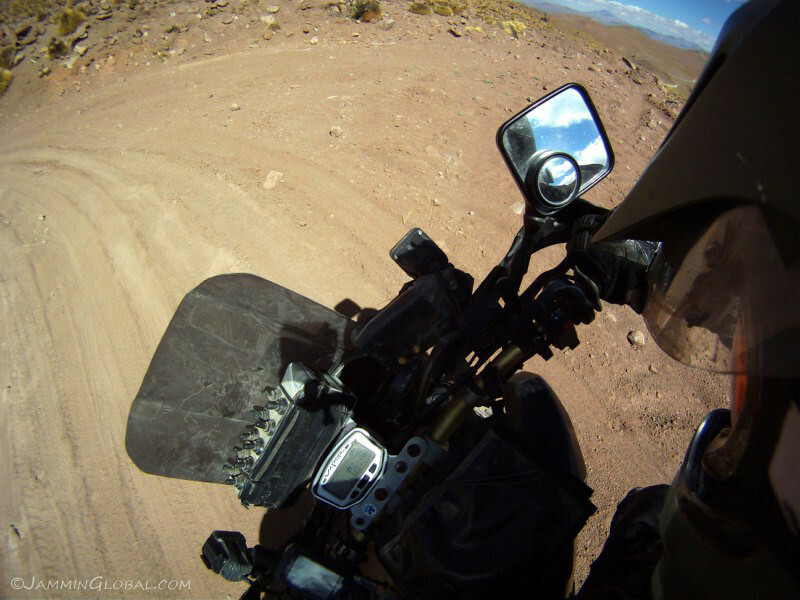 Crossing a pass at 4,389 m (14,400 ft) and already getting a good taste for Ruta 40 as it passed through the province of Salta. 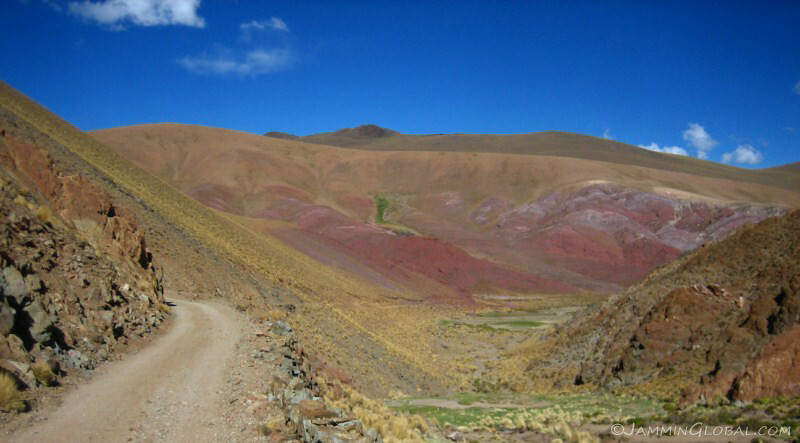 The distinct colors of the varied minerals showing through as the route descended from the summit. It was getting late in the day and the colors were more vivid. 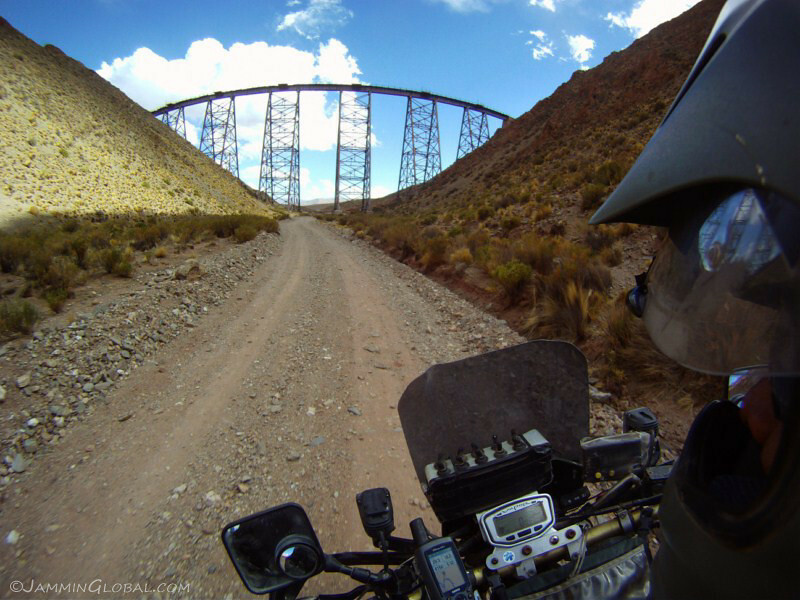 Passing under the Viaducto La Polvorilla, which carries the tracks for the Tren a las Nubes (train to the clouds), a tourist attraction that leaves from Salta and climbs up to the Andean plateau up here. The clarity of the air at this altitude made the landscape ‘pop’. A wide angle view of the valley that we would descend down towards San Antonio. 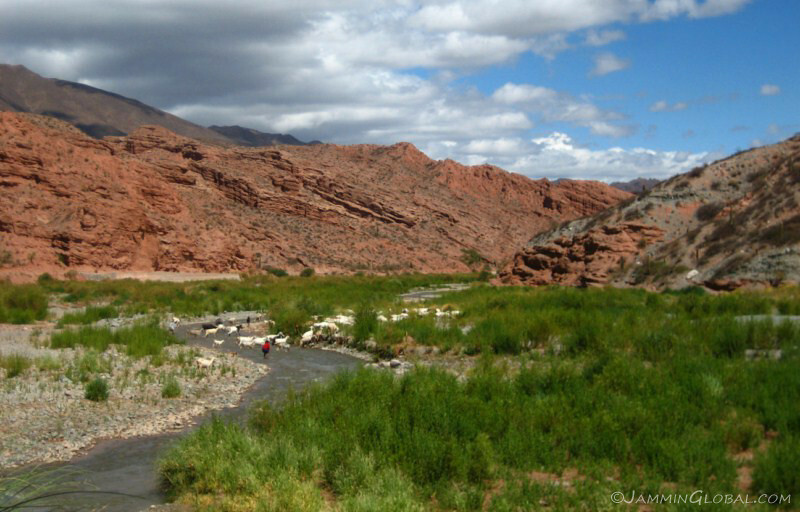 Not a clean stitch, but a wide view of the route following a dry river bed. …I found a cheap room at Hostal del Cielo for P40 ($10), which included breakfast and kitchen access to prepare dinner. 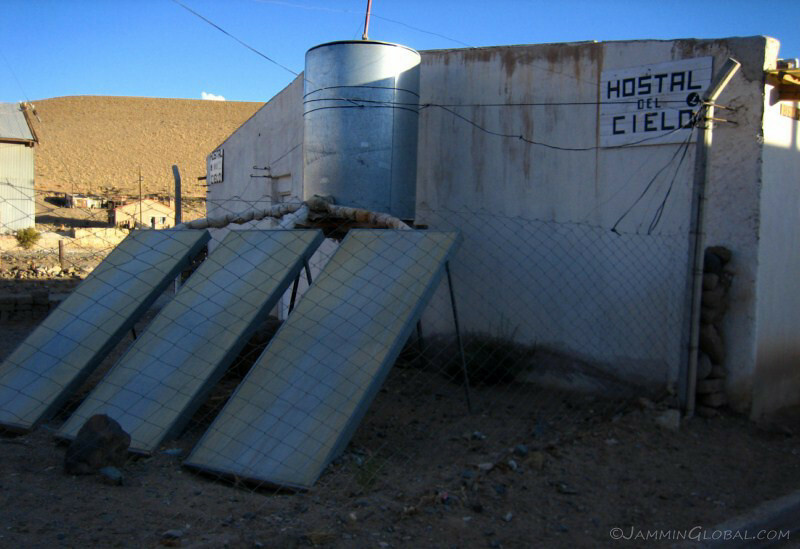 There’s not much electricity up here, so the hot water is produced with these solar thermal heaters. 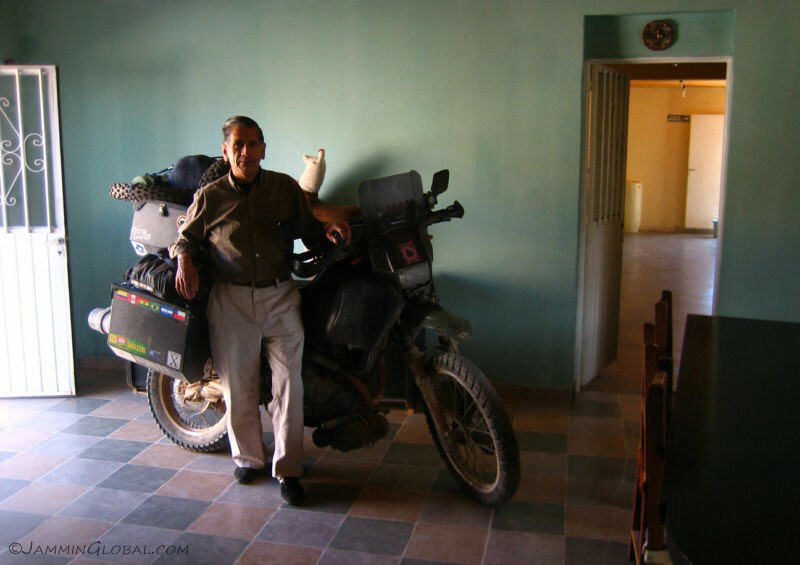 I was the only guest of Mario’s, who lives in Salta but runs this hotel with his family for travelers up here. sanDRina enjoyed staying indoors as the winds picked up at night and were quite strong, blowing things around on the street. 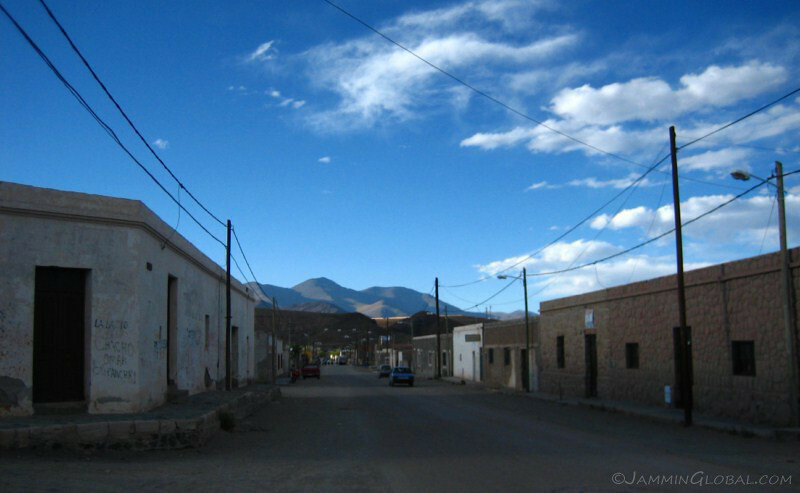 The town is pretty run down, but there’s a big military base, which probably keeps it going. 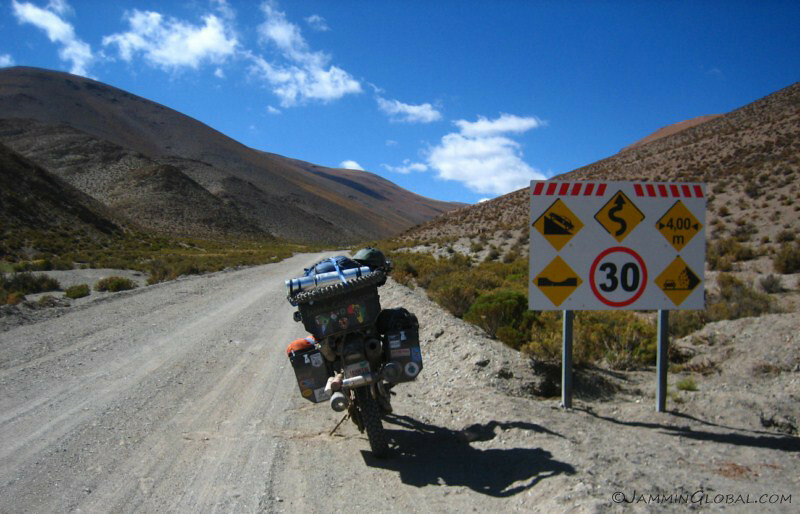 Turning back onto Ruta 40 and capturing the highest marked mile marker that I’ve seen. 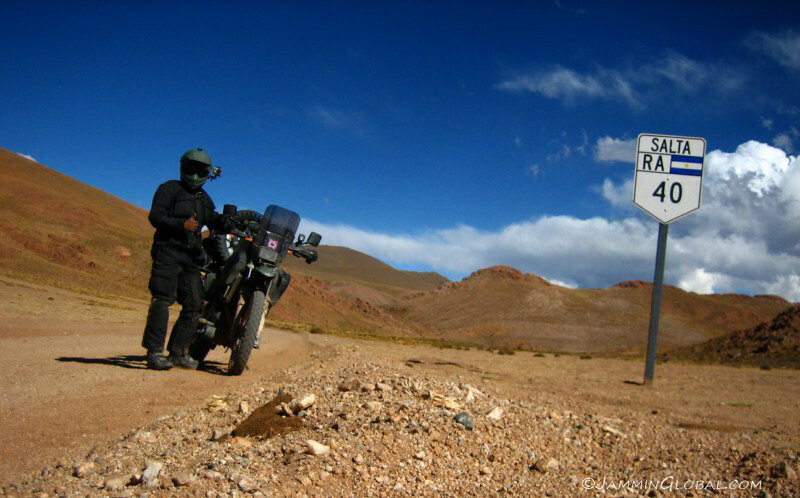 This route continues south for another 4,626 kms (2,891 mi) ending near Rio Gallegos. 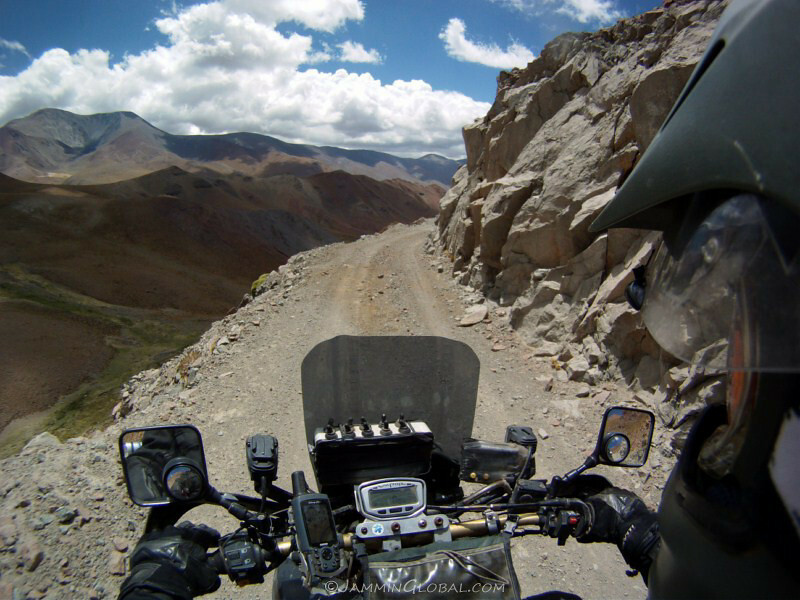 Twisty, narrow, inclined road with dips and falling rocks – a recipe for an adventure. 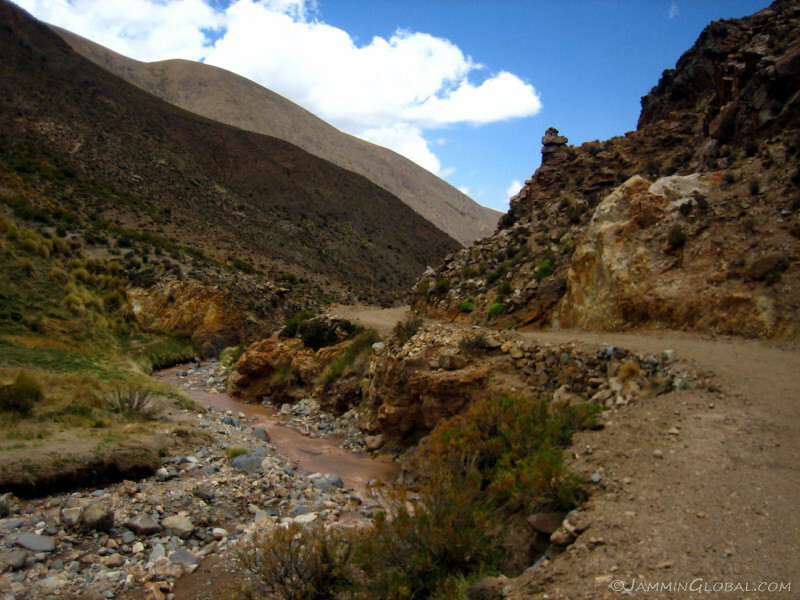 Climbing up the narrow, cliff-hugging track through the Abra el Acay protected area. 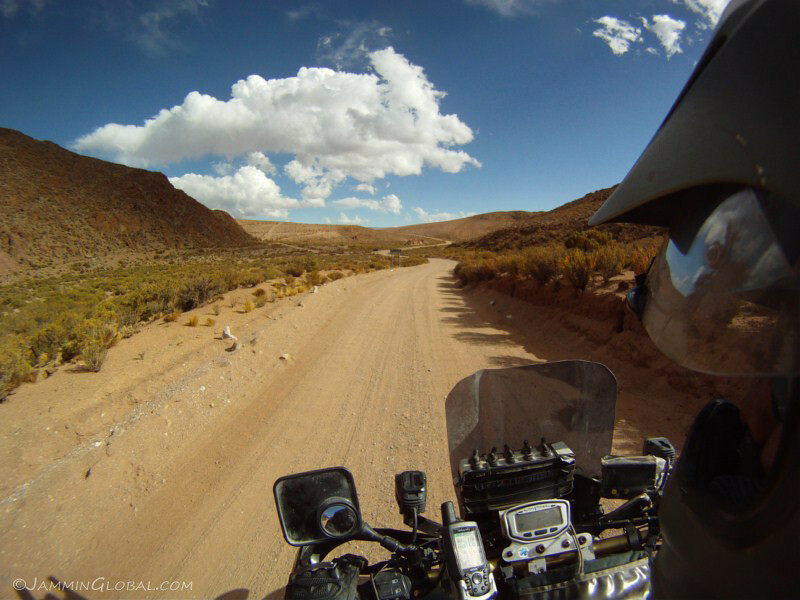 Things were going smoothly as I slowly gained elevation and enjoyed the remoteness. This doesn’t look good. I came into this sandy switch-back at the wrong angle, lost balance and before I could get my foot down, gravity had won and took sanDRina down. With the adrenaline pumping, I first turned off the ignition and then both fuel petcocks and quickly tried to lift her back up, but she wouldn’t budge. 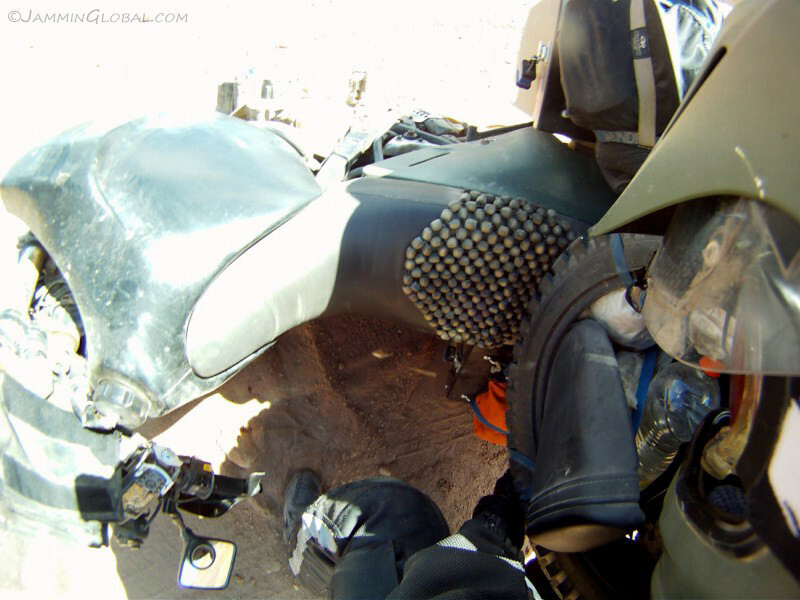 The first real drop of the bike while off-roading of the whole trip. Not bad. 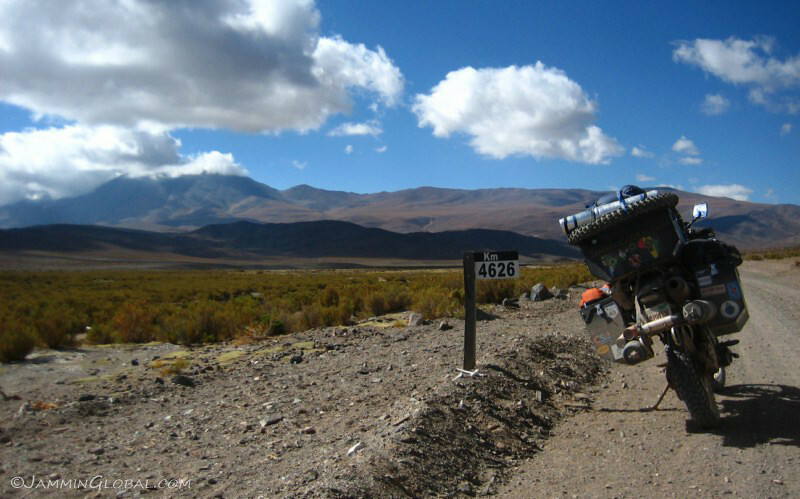 But not good that it happened at 4,816 m (15,800 ft) on a remote road, with no local traffic (since there’s an alternative paved route around this section). I didn’t pass a single car in the previous hour and none looked like it was coming. I tried lifting her again using the strength of my back, but no go. I then rotated her, so that the front tire would be pointing downhill and slightly reducing the force needed to fight against gravity. 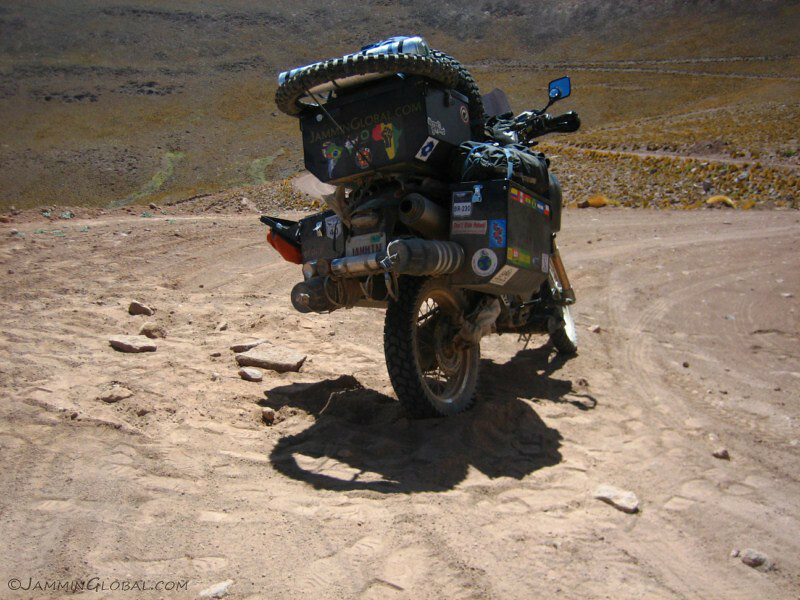 I still couldn’t lift her and finally realized I had to remove as much weight as I could and emptied the panniers and the spare tires. Yard sale on the 40? And with a good heave, sanDRina woke up from her nap. I will survive! If push comes to shove, I know I can pick up the bike by myself, but it’s going to take at least an hour to repack everything on the bike. 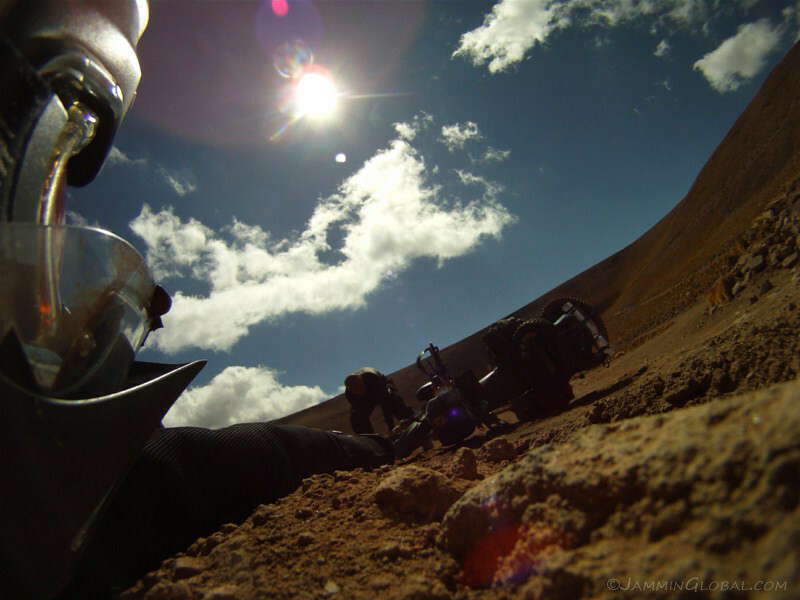 All set to go again and the nicely graded sand looked like a battle scene. Since I was pointing downhill, I had to back track a bit and attack this corner again with the proper line to put down any doubts. 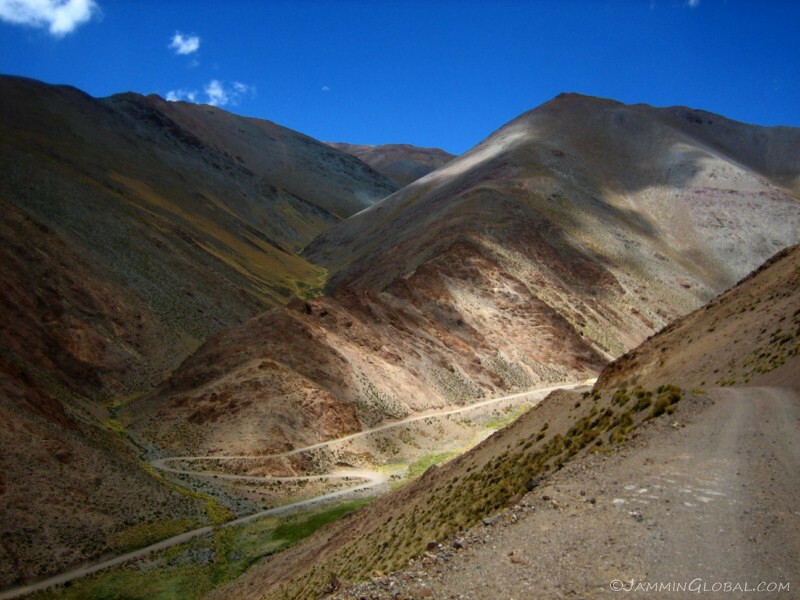 Looking back at the way I came as Ruta 40 climbed up this pass. 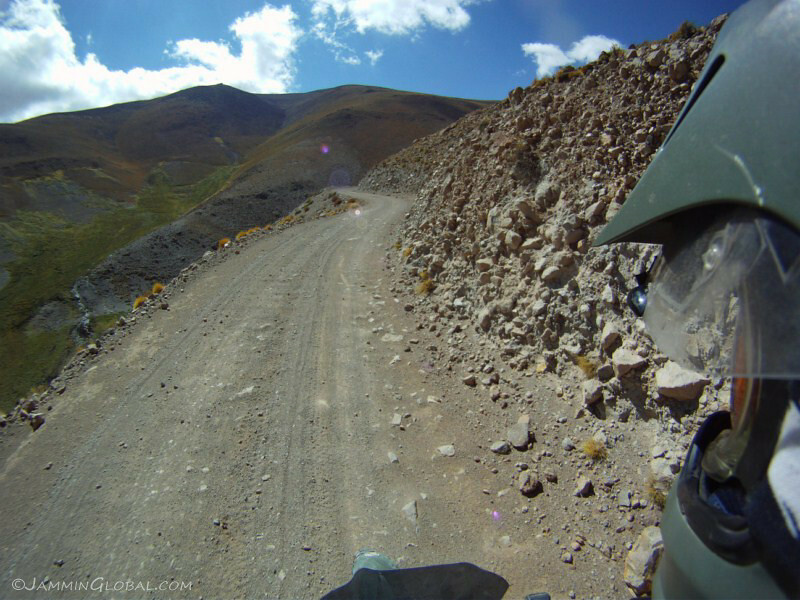 My oopsie happened in one of those hairpin turns on the left. 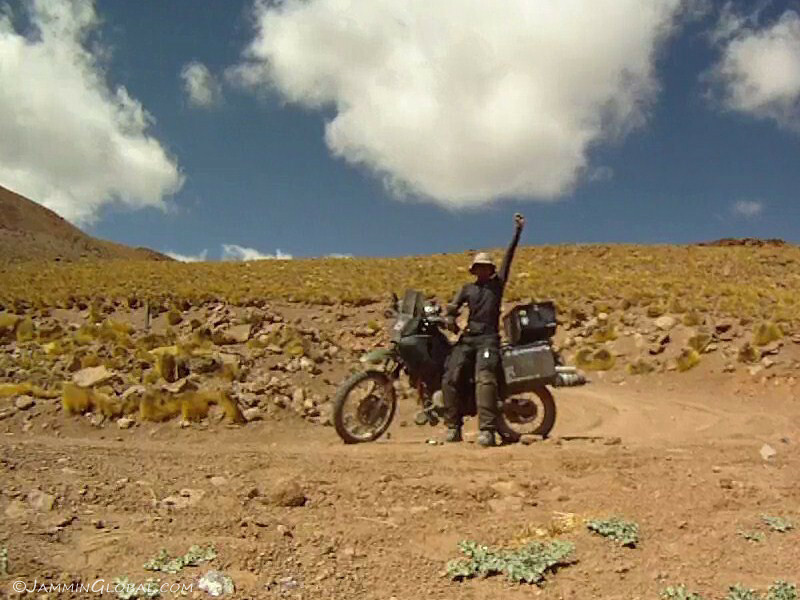 At the summit of the Abra el Acay at 4,970 m (16,300 ft). 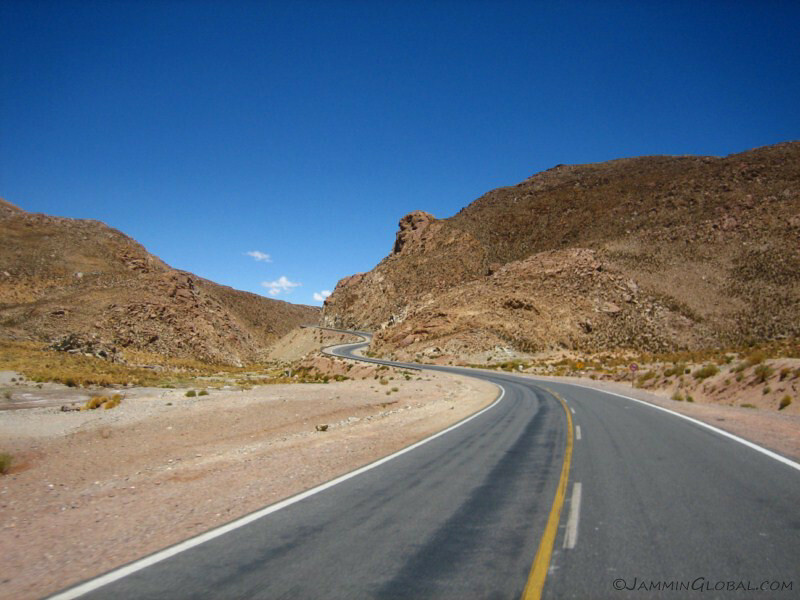 I was heading to Cachi. Wide view of the route descending down the other side. 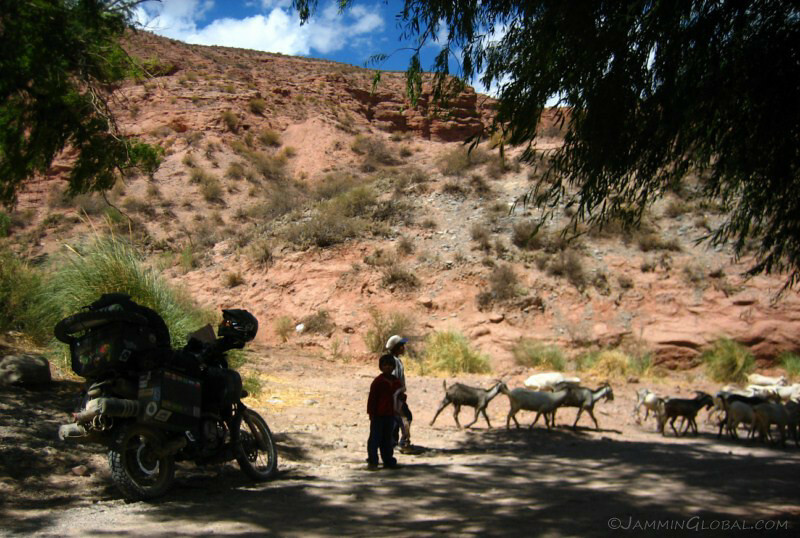 Resembling my favorite roads of northern Peru and Bolivia, Ruta 40 hugged the steep, rocky cliffs of this colorful landscape. 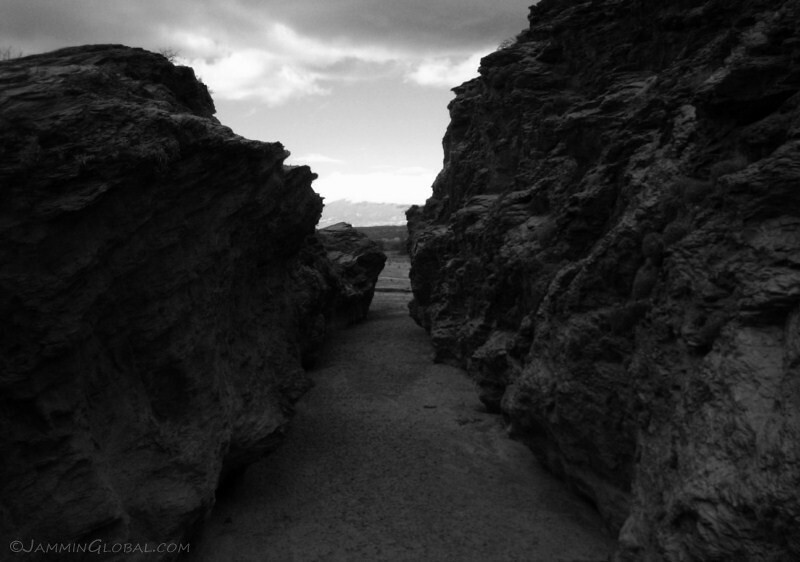 …with no guard rails and a loose, sandy, rocky surface, one fall could be the end. However, thoughts like that don’t surface to the front when you’re actually there. You just get on with it and keep going forward. 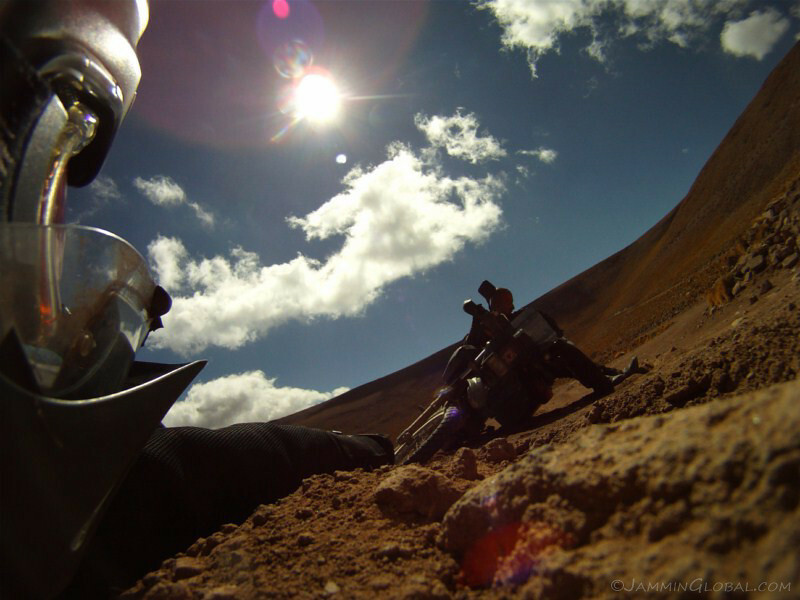 Let the GoPro take the pictures. A hairpin turn and successive others dropping down into the valley. Going from this side to that side. Looking back at the summit of Abra el Acay. 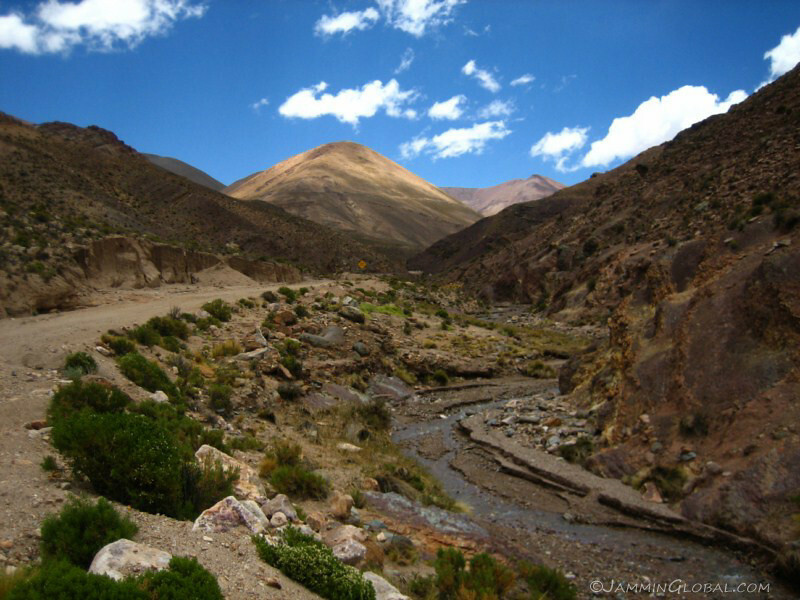 And looking forward as the route followed the ever growing Rio Calchaqui. 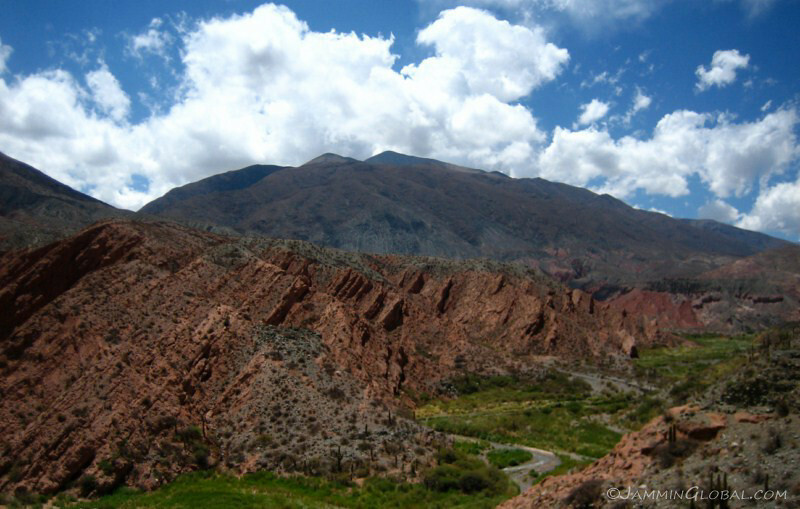 A syncline in the rocks, where the younger sedimentary layers are surrounded by older ones. 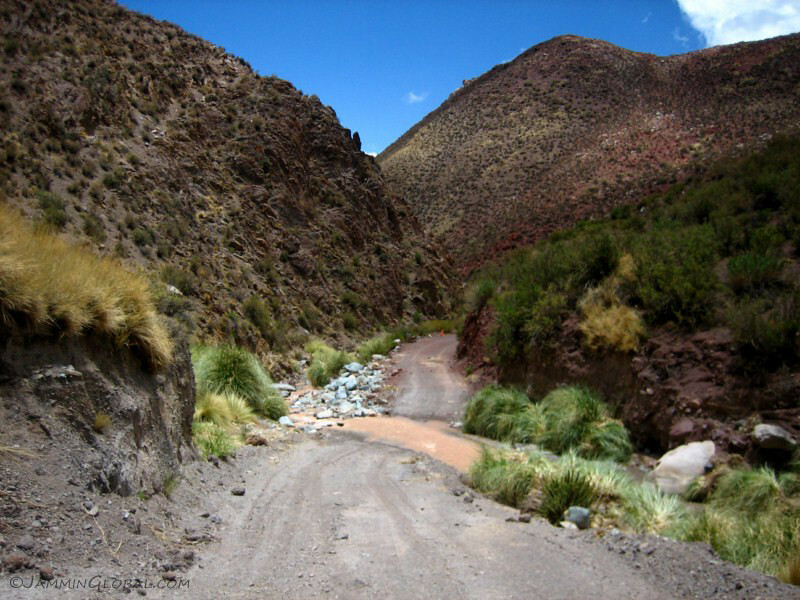 One of numerous small water crossings as the route crossed back and forth from one side of the valley to the other across Rio Calchaqui. Coming across the first few settlements, which slowly turned into farms. 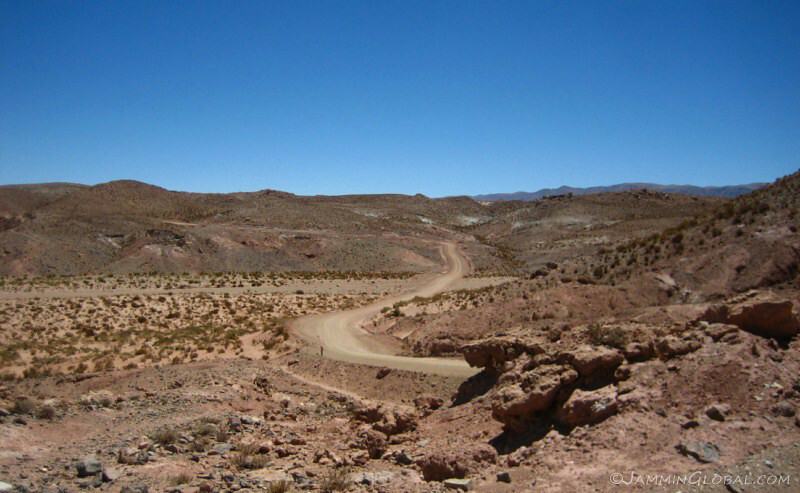 A wide view of Ruta 40 in the Rio Bravo valley. 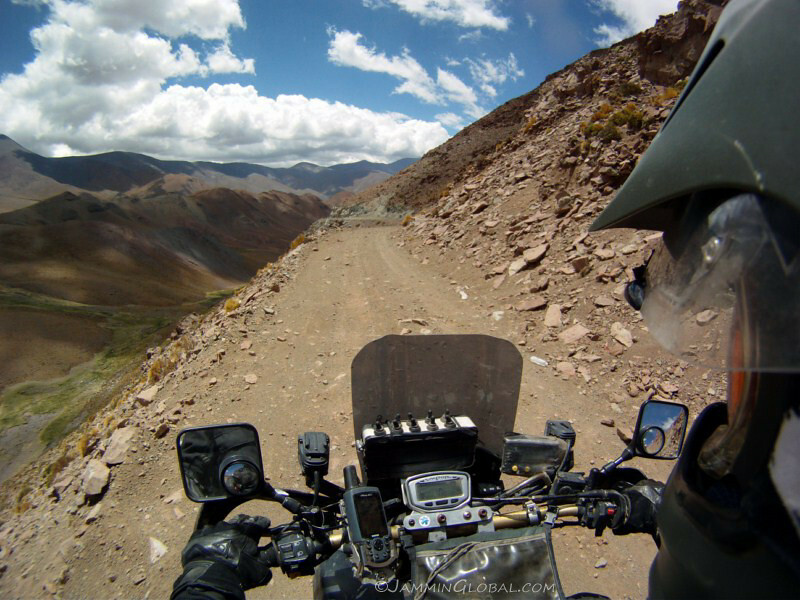 …but generally, the route was in good condition, allowing for some good speeds. 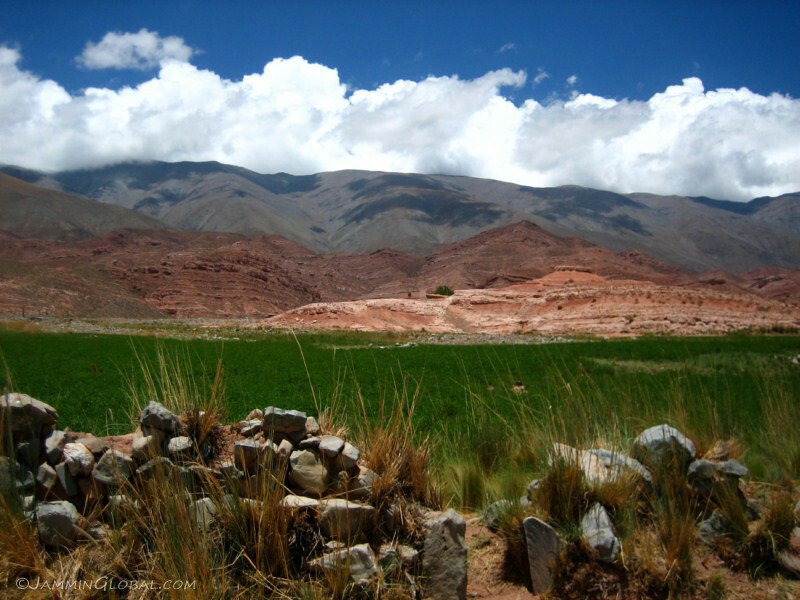 A crumbling wall of a farm set below the colorful mountains of Northwest Argentina. 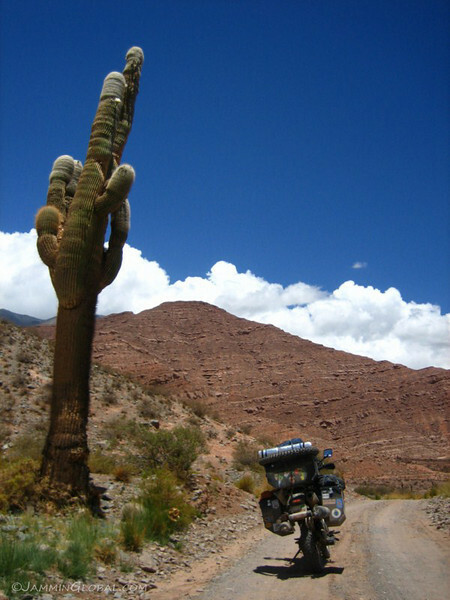 A big cactus plant, reminding me of the tall saguaro cactus outside Dave’s house in Phoenix, Arizona. 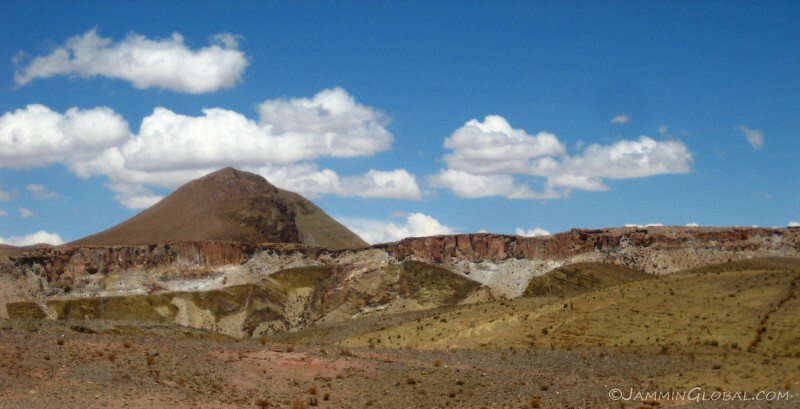 A panorama capturing the vivid color palette of this area. 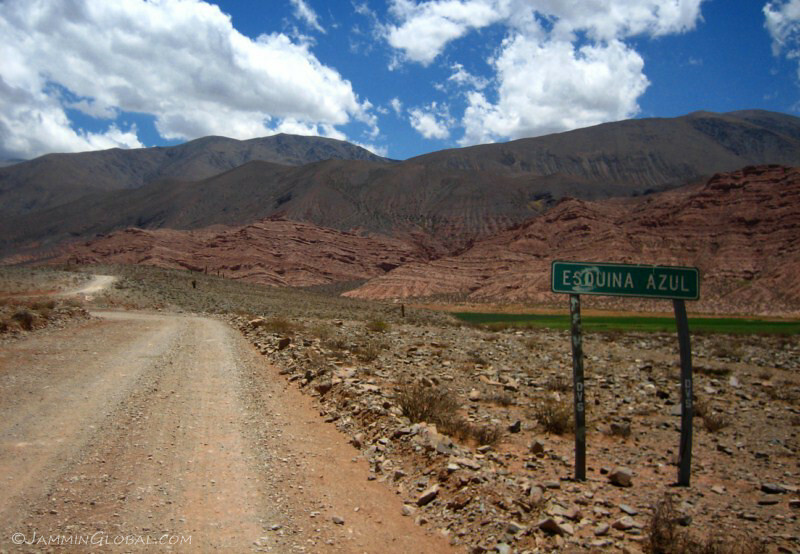 Esquina Azul (blue corner), how aptly named. 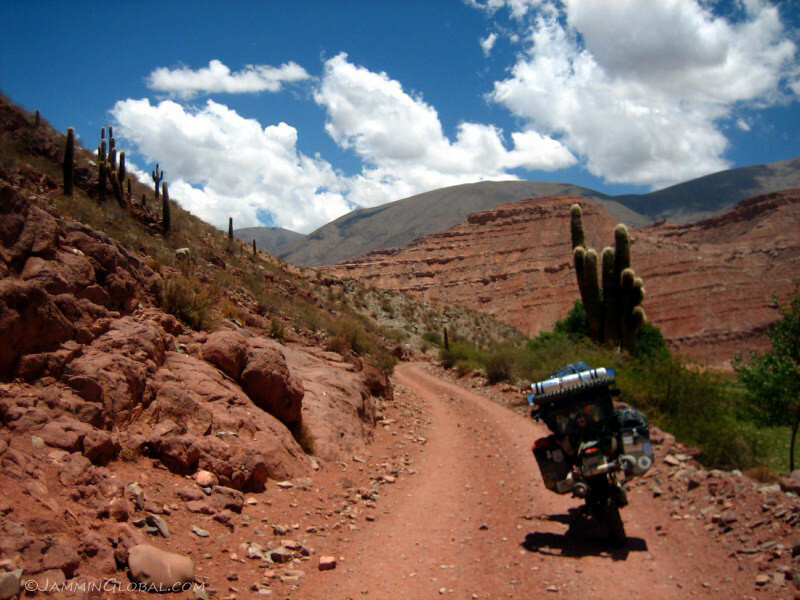 After passing through some farmland, the route became interesting again as it followed atop a canyon. I didn’t see a sign around but I bet these spiky, upturned layers of rock would be called El Spina del Diablo (the devil’s spine). I’d love to have some farmland with such striking backdrops. As I ate some lunch under the shade of this tree, these two young boys came by herding their goats. 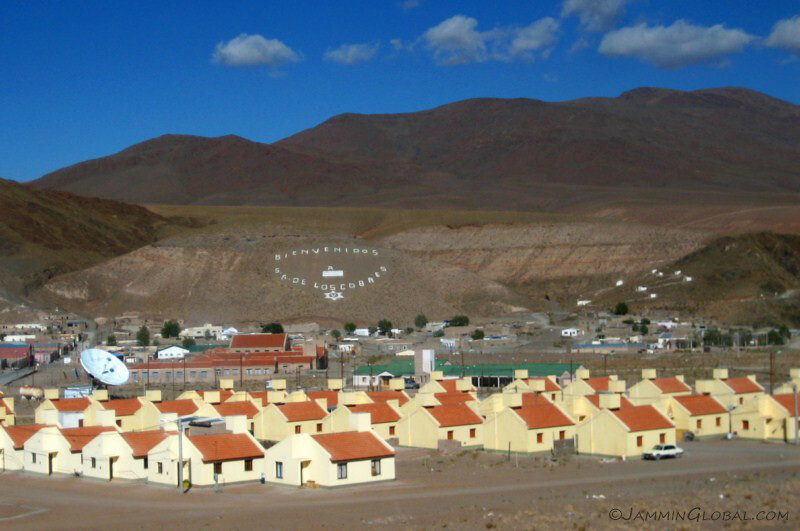 Argentina has a reputation of being predominantly white, which it is, but not much is heard about Argentina’s brown residents, the indigenous people, who have lived here in these mountains for hundreds or even thousands of years. I watched them as they directed their herd across this flowing stream, lending a helping hand to a young kid (baby goat). 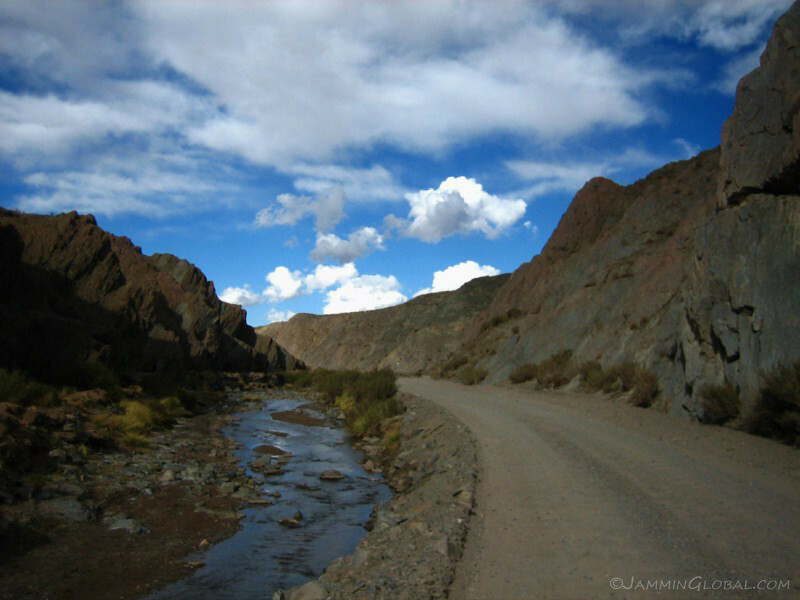 The beautiful ride through this multi-colored canyon made for an enjoyable day on the 40. 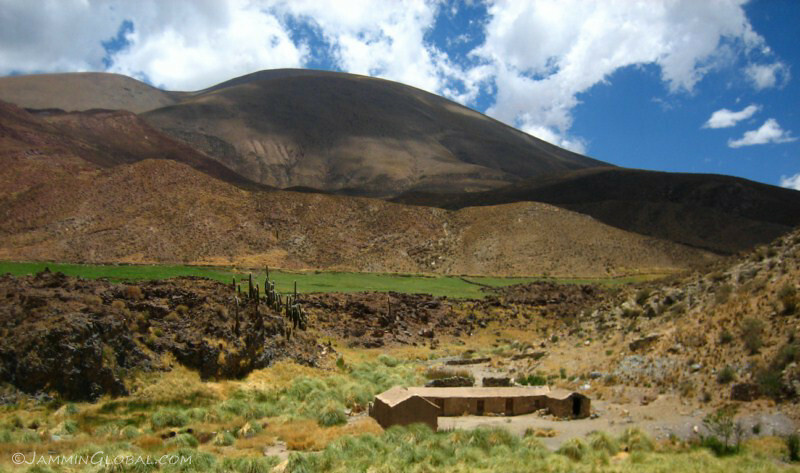 Farmlands increased as the terrain flattened out and the route got closer to Cachi. 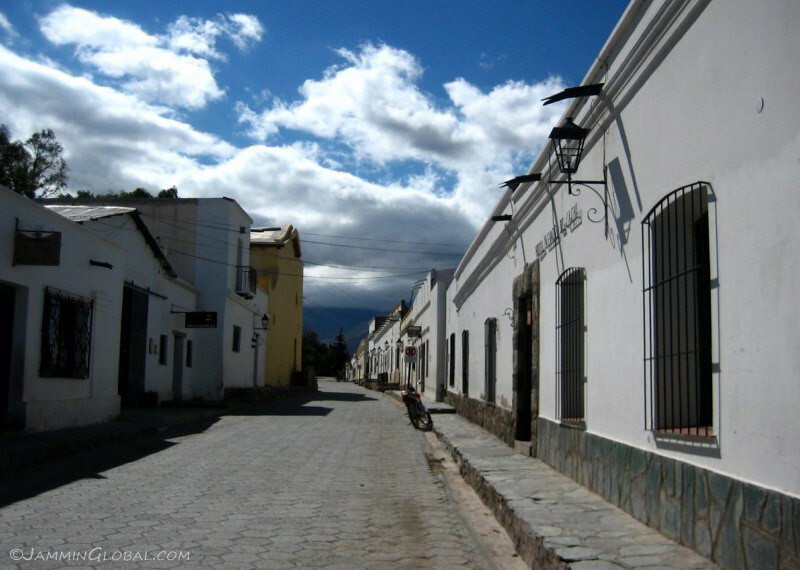 Passing through the sleepy little town of Cachi, in the middle of a wine renaissance. 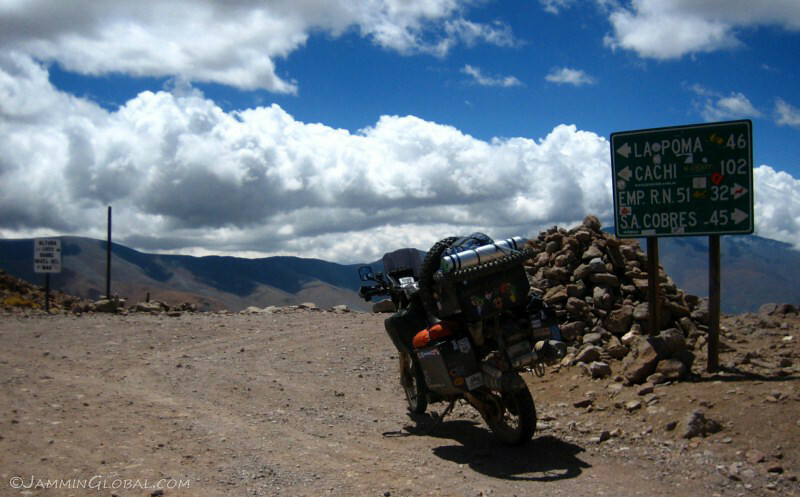 I topped up petrol and fresh water and then set out in search for a place to camp for the night. Passing by a very narrow canyon cut through the rock. 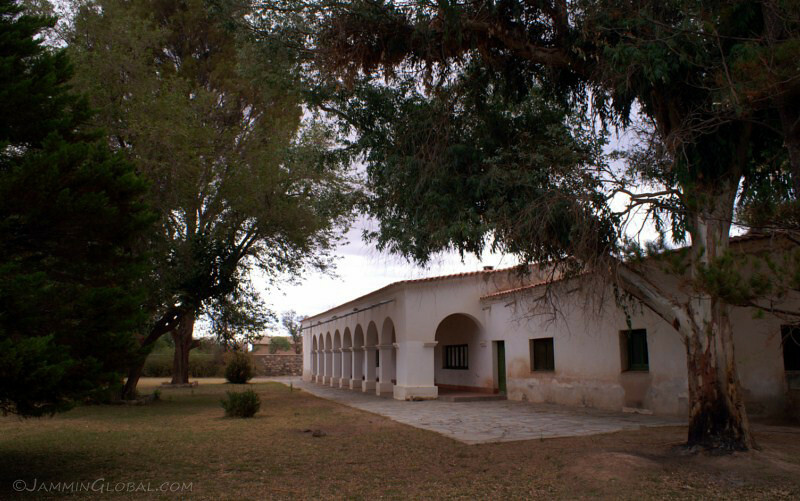 This farm house looked deserted and as I pulled up, an old lady, the caretaker (who was living with her family in a small hut in the back) came up and I asked if I could camp here for the night, which was no problem, since the owners were away in Salta and rarely came here anymore. 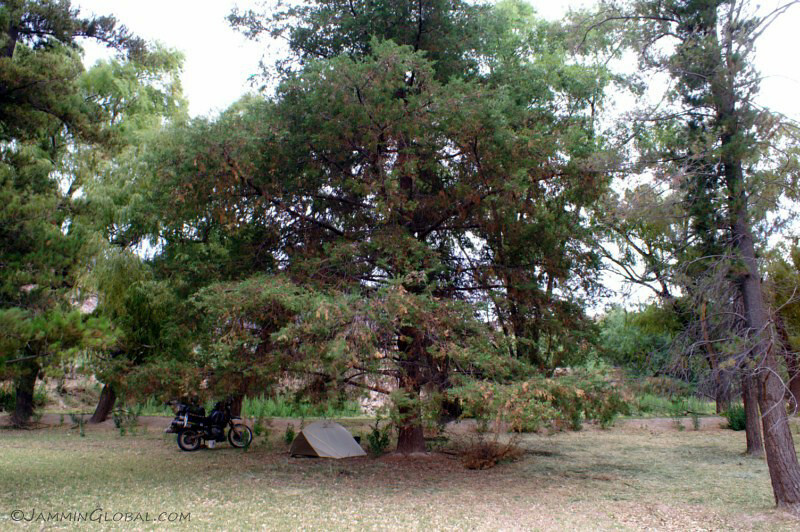 I found a nice spot under this tree and the old lady brought me a 5 liter can of water, with which I managed to have a small bath and cook my dinner with. There was abundant firewood around and she said I could use whatever I wanted. 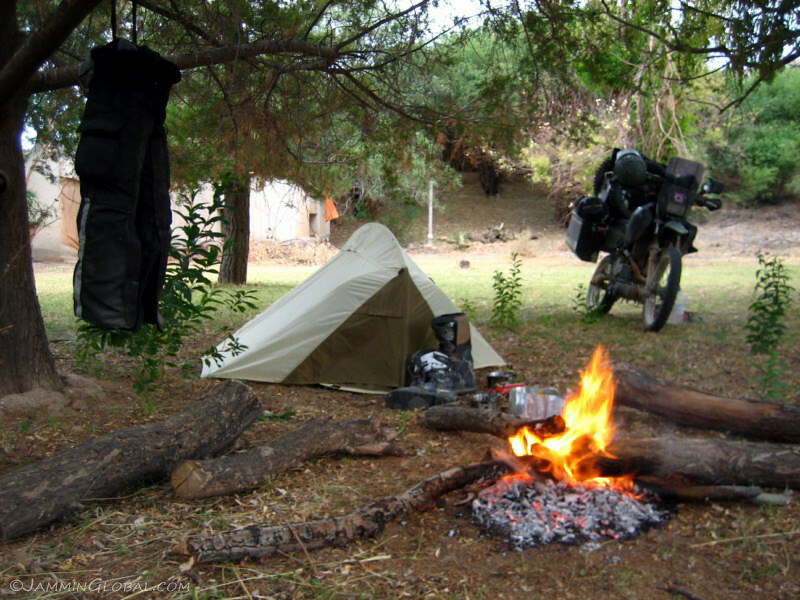 All the camping I had done up to now was mainly to take shelter for the night and no campfires were made as I didn’t want to advertise my position. 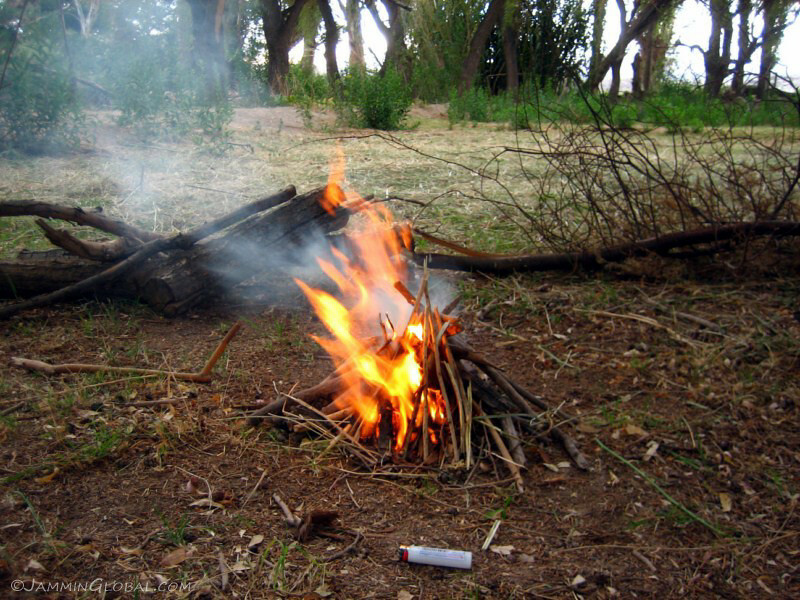 However, Argentina is a safe country with an established camping culture and I could finally make campfires. 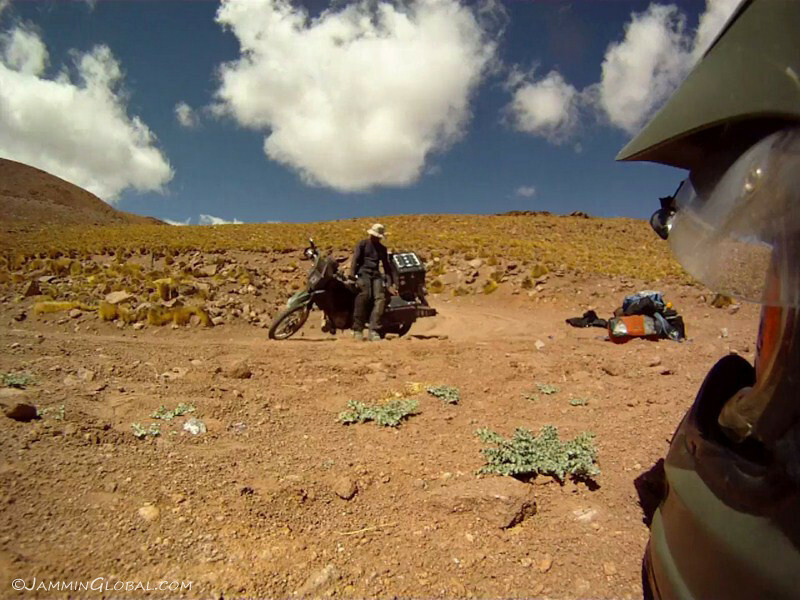 Now, that’s an inviting home… to a nomad on a motorcycle. 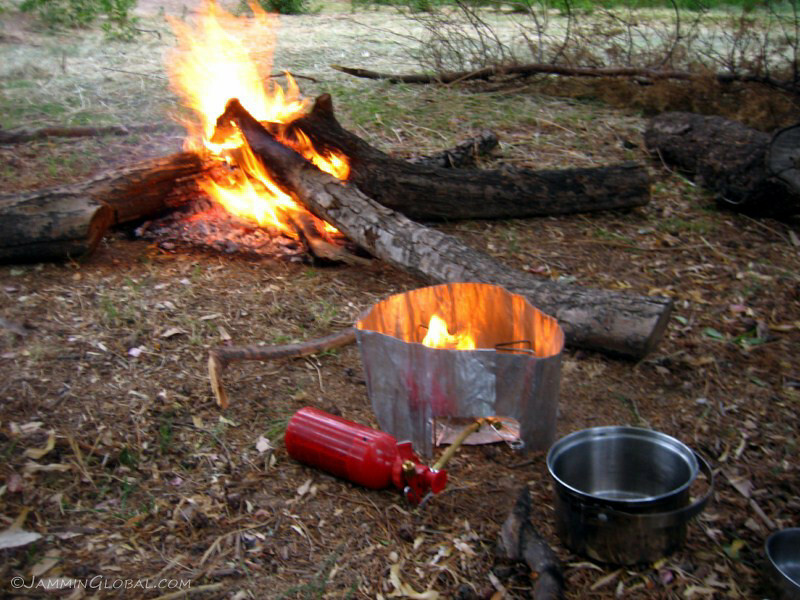 I got my stove going to cook up some dinner as I didn’t want to put my pots on the campfire, since the soot would make a mess of my gear. Ahhh. 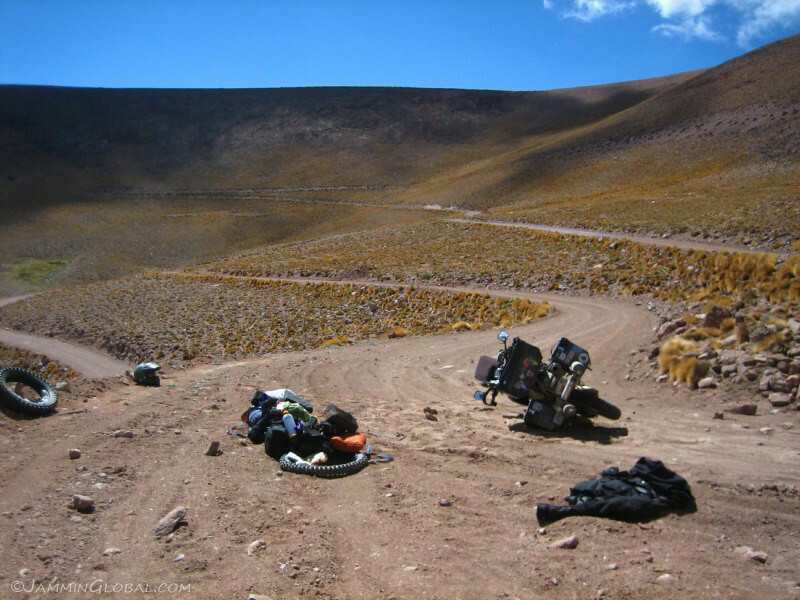 It was around 2,100 m (6,890 ft) and with no wind, it was very comfortable in the evening and I could enjoy staying outdoors with minimal clothing, making it very comfortable (compared to the rough conditions on the Lagunas Route). It is times like this, that I most feel like a nomad. 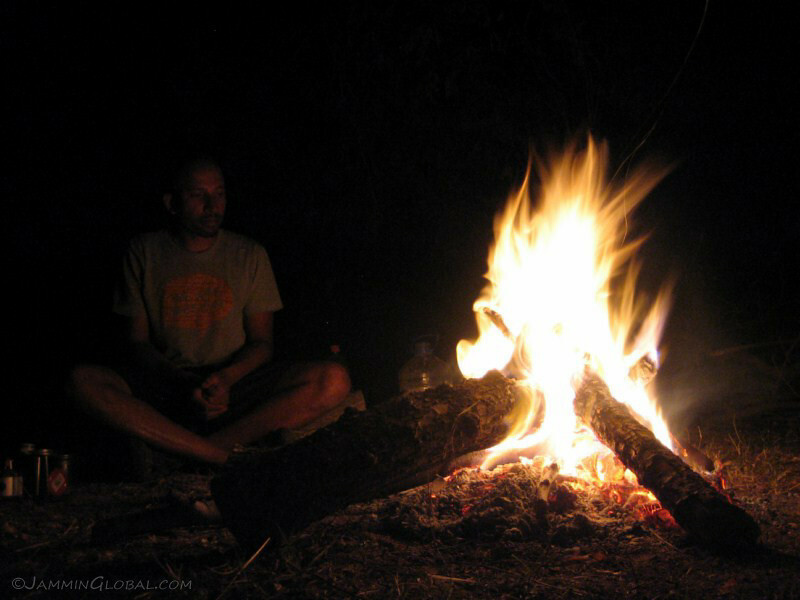 Even with a fall at high-altitude, the feeling of being around a warm fire soothed all ills.